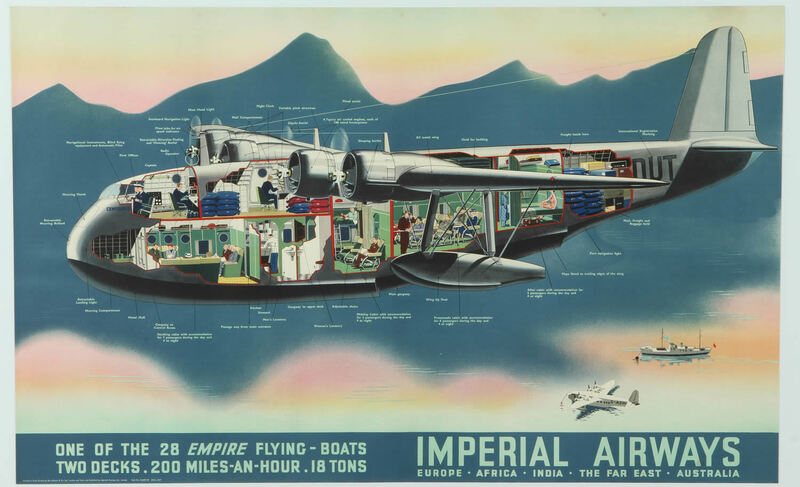 Imperial Airways Empire Class Flying Boat advertising poster, 1937. 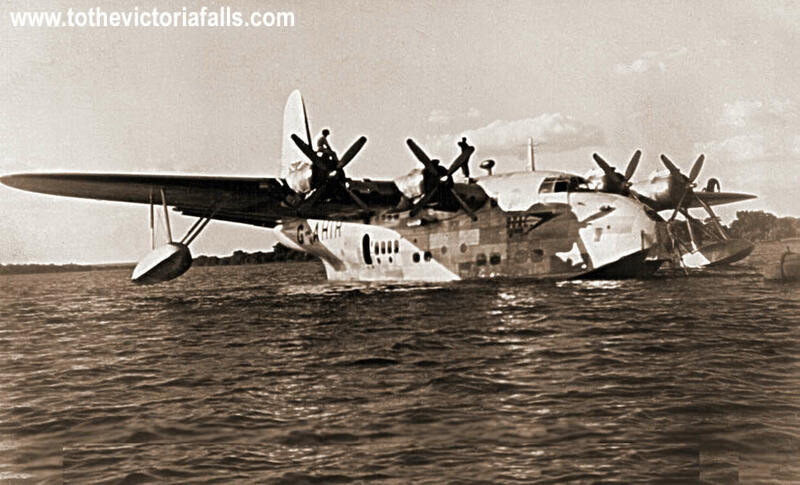 In 1947 British Overseas Airways Corporation (BOAC) introduced the famous Short Solent S45 class of flying boat, based on the military Sunderland float planes, and a new trans-African airmail route was launched from Southampton to Vaaldam, Johannesburg, transporting mail across the world in days rather than weeks. 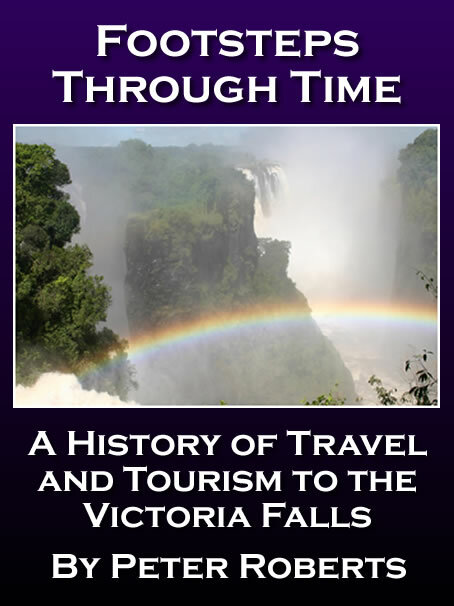 Operating the route twice-weekly (later increased to three services) the flying boat service evolved as an airmail service between England and South Africa, but also offered a unique mode of tourism travel, bringing more visitors to the Falls. The low-flying Solents weighed 35 tons and were powered by four Bristol Hercules engines with a cruising speed of 210 mph (338 kmph). The aircraft carried a crew of seven, with up to 34 passengers plus mail and cargo. Tickets for the 6,350 mile (10,219 km) journey were advertised at £167 single and £300 12s return. 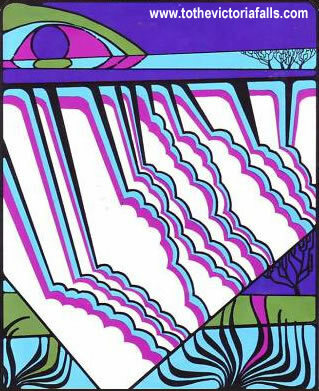 There was no flying at night, and the route included overnight stops in Sicily, Luxor, Kampala and Victoria Falls. 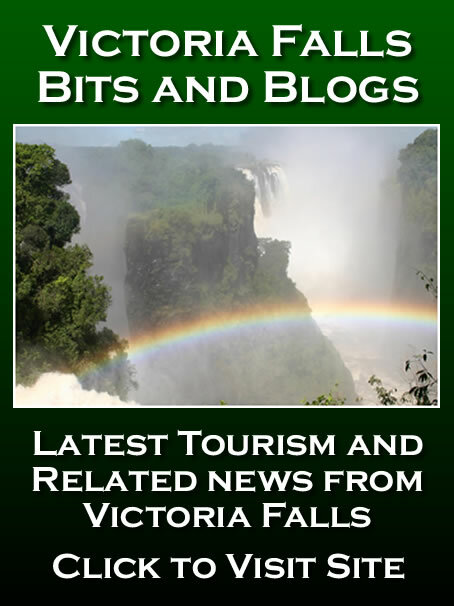 The flying boats landed, and were serviced, on a wide flat stretch of the Zambezi River some seven kilometres upstream of the Falls, stretching 2,500 yards (2,286 m) in length, and 500 yards (457 m) wide. 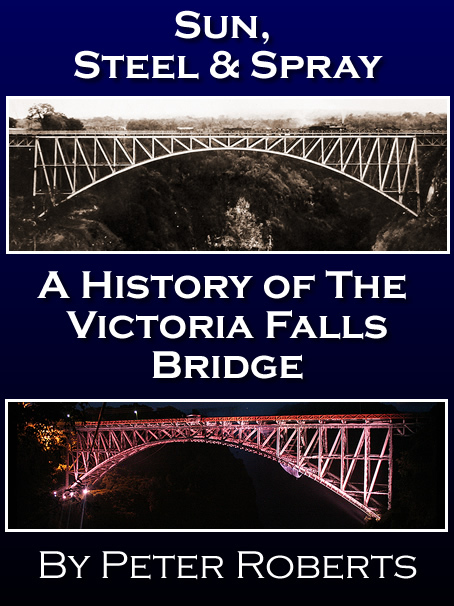 Construction of a terminal reception, landing stage and jetty, as well as a road linking with the Victoria Falls town and Hotel, was completed in late 1947. The first Solent flying boat landed on a test flight on 11th December 1947, and the first commercial service was operated on 4th May 1948. 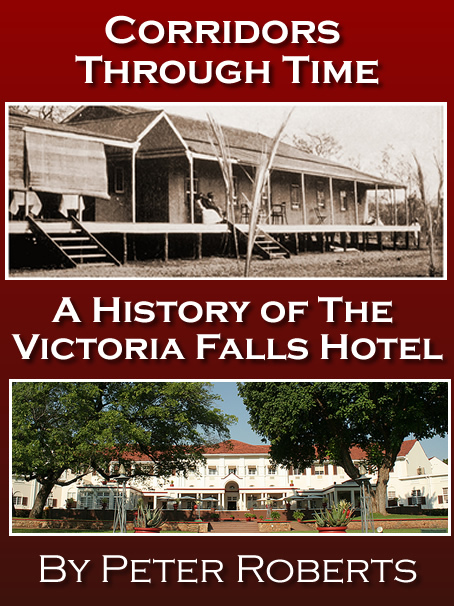 The stopover at the Falls Hotel soon became one of the highlights of the route for those few lucky enough to experience the journey, and the stretch of river and terminal reception where the planes landed became affectionately known as the ‘Jungle Junction,’ a nickname apparently first given by a reporter from the Bulawayo Chronicle. 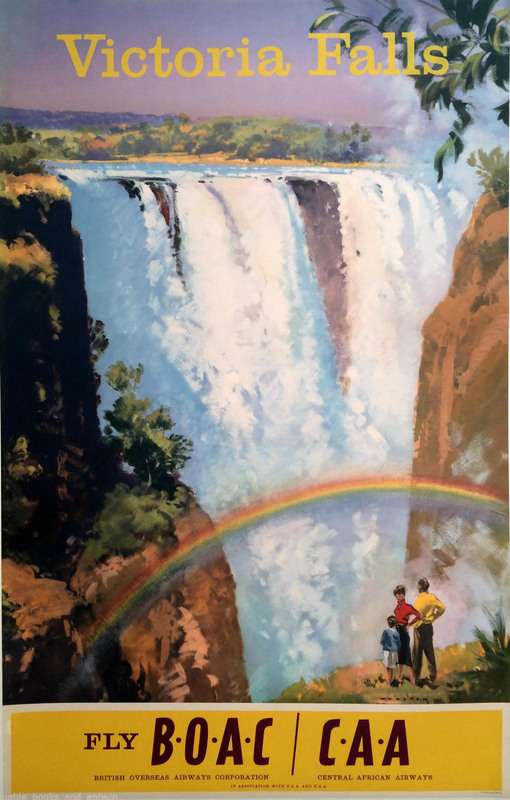 BOAC travel poster, Victoria Falls, 1949 Frank Wootton. The Hotel was responsible for providing the onboard catering for the return journey. Food rationing was still in force in England after the war and the passengers were apparently always impressed by the sumptuous catering on board. “[I was] on the wing after landing when we heard screams from one of the first passengers ashore... in the trees bordering the pathway up from the jetty a lady passenger had come face to face with darkest Africa. A mighty python was draped along an overhanging branch and in its mouth was a half-swallowed monkey! Rest of night uneventful at Falls Hotel. Take-off next morning was at 06:30 and downstream, just about to unstick when nasty, grinding noise brought proceedings to a halt. “We had hit a rock and not done a lot of good to the keel. I shinned down the central ladder and beheld a strange sight. The passengers were still sitting, belted in, whilst around them floated a miscellaneous assortment of newspapers, handbags, magazines etc. 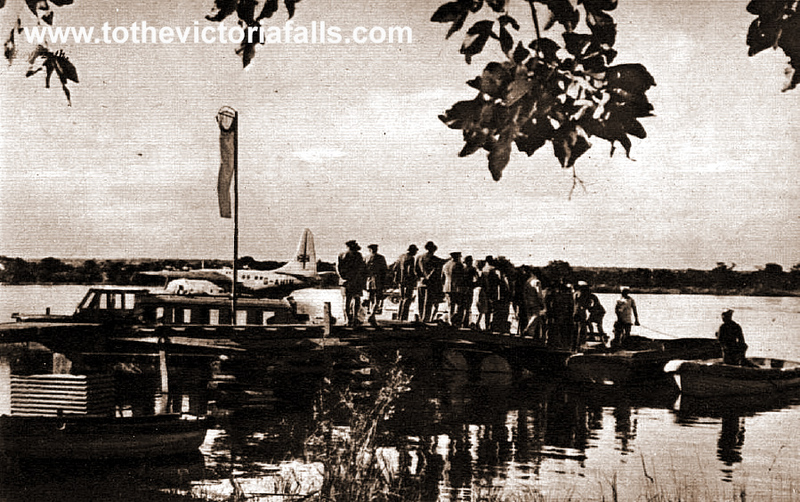 BOAC Flying Boat moored on the Zambezi, 1948. Picture by Raymond Critchell, fireman based at the river. A mural at the back entrance to the Victoria Falls Hotel also celebrates this unique period of transport. 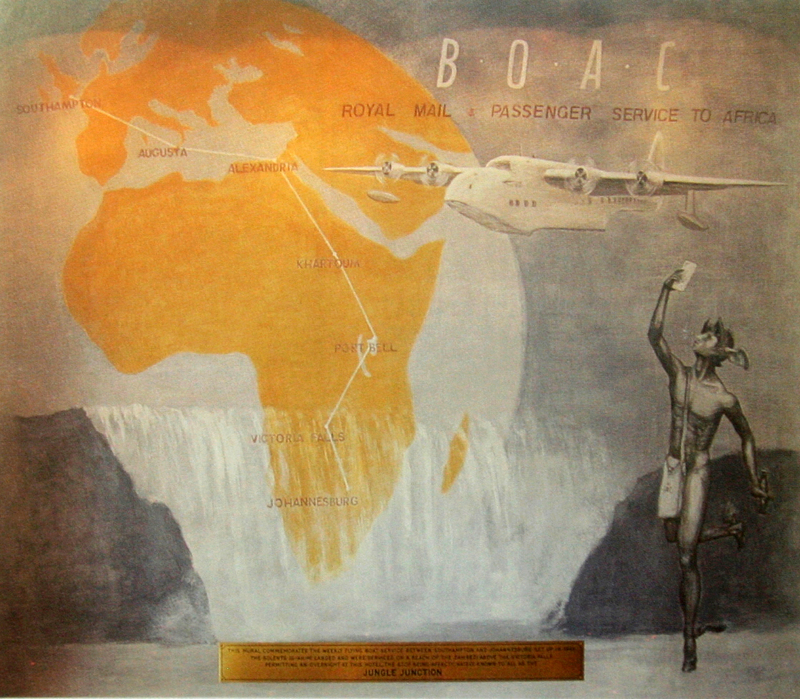 Victoria Falls Hotel mural celebrating the Flying Boat Service. 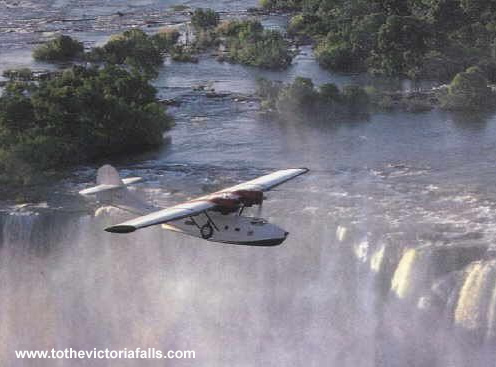 Flying boats were to return to the Zambezi in 1988, when a Catalina seaplane (Z-CAT) operated by the Catalina Safari Company (owned by Frenchman Pierre Jaunet) would stop on the route from Cairo to the Cape. The plane operated for six years.